Connecting with an animal family member on the Otherside can be a life affirming and heart healing experience. Roscoe is a good example of the process of individual growth and enrichment that can take place on the Earthplane and then is carried over to the Otherside. This dog crossed over with a “suitcase” full of positive, enriching life experiences that are important stepping stones to a future incarnation. These experiences create the cellular memory we store, process and carry forward and which eventually manifests as wisdom. That is what we see in the eyes of a dog that is deep and knowing. The individual who barely needs obedience training, who is present and focused; who appears to understand his world and yours from his heart and soul. This extraordinary accomplishment does not happen in one lifetime, but over the course of several. Each lifetime contributing (or not) to the advancement of the whole. At first Roscoe is a simple, immature large dog. By the time he finds himself in the shelter and up for adoption at the age of one his expectations of people and life are very low. Had he not found Roe and she him, things might have just stayed at the same extremely basic level of advancement or growth. He would not have become Roe, Rahul and John’s Roscoe. By the way, I never cease to be amazed at how we are coupled with just the right animal for our personal growth and for theirs. 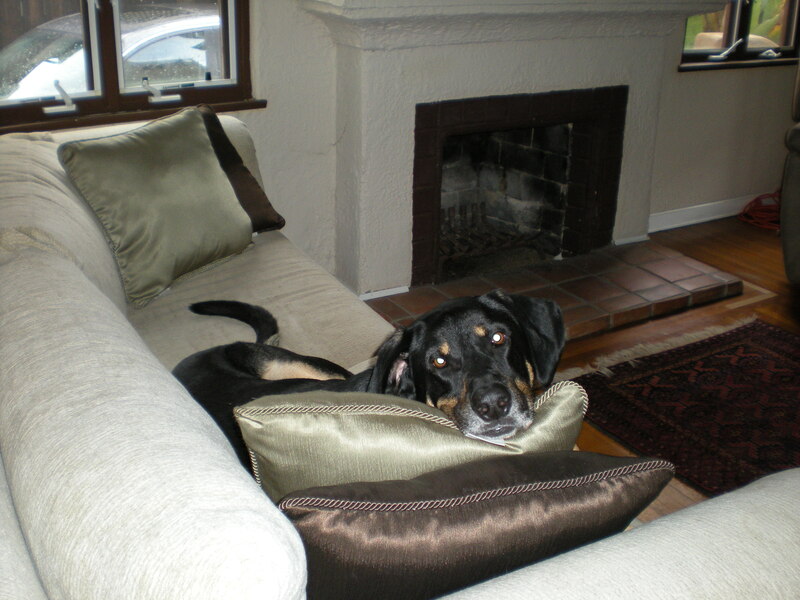 As a young dog Roscoe was rambunctious and excited, even more so when he was in the house. Roe’s college roommates asked that he stay in the yard until Roe came home from her classes. Only then was he allowed to come in and be in her room. While being in the yard for long hours Roscoe often broke things. He pulled cables, took off screens, and went after the irrigation system. Even with obedience training he was a lot of work and high energy. Truly, in the early years this dog required a huge commitment and dedication from Roe. She never gave up or considered Roscoe’s behavior anything that couldn’t be sorted out in time. She simply stuck to it, payed for the damages and moved on. From Roscoe’s submissive and fearful behavior around men Roe surmised that he had been abused. If a male took off his belt while he was around he would hide. If a big man wanted to pet him on the street he would pee submissively. It is important to note, that Roe’s friend John and her husband Rahul, played an important role in healing the emotional damage done by a man in the early part of his life. When Roe and Rahul got engaged they moved in together in a townhouse. John continued to visit and help with Roscoe. The first day Roscoe was put outside when they left for the day, a neighbor reported that he barked pitifully. He just didn’t want to be outside alone anymore and he preferred to be inside while they were gone. From then on that is where Roscoe waited for their return without getting into trouble. To provide a safe release of his energy they took him to the dog park four times a day. The non-verbal communication process with someone on the Otherside is pretty much the same as having a phone consult. The animal or person you are communicating with is invisible, but the connection/communication is very real. Most of the time I use a picture of the individual to provide focus, and then I scan the energy coming towards me for the energetic frequency on which the communication is to take place. It is much like turning the dial on an FM radio receiver to establish a good reception. Once I sense I’m connected and clearly feel the energy of the animal on the Otherside I proceed as usual. The person with me or on the phone line anchors the process. It is definitely a cooperative endeavor. Years ago I was very amused by a conclusion made by Stuart Wilde in his book Affirmations, about his experience in this area “…if you are thick as two planks when you are alive, you are thick as two planks when you are dead.” It points out that building awareness, consciousness and understanding and ultimately personal growth is accomplished down here, in the physical realm of Mother Earth. For some reason, perhaps influenced by religious thinking I had assumed that once we were on the Otherside all would be revealed, and we would be enlightened and wise. I see now, after much studying and my personal experience with communication on the Otherside how our lives here on the Earthplane are so important because much of our applied learning is done here, not there. On a less complex level it is the same with our furry ones. In the name of expanded learning and awareness, animal beings incarnate and also reincarnate in different species. They can be wild, feral, or domesticated. When they choose to be with us and be our close companions their lives are intertwined with ours and another level of growth, more complex, ensues. This is where Roscoe’s life fits. Like many, his entry into the world as a domestic dog wasn’t easy. Whoever got him to the shelter did him a great favor and gave him a second chance. Had he not encountered a dedicated person like Roe he might not have made as much progress. The diamond would certainly have stayed in the rough. The Roscoe of the early days is a distant unsophisticated version of the more centered Roscoe of the later years. (Raccoon invasions excluded.) Dogs like Roscoe take a lot of work, but the rewards are great for all involved especially when you know he crossed over with his cellular memory filled with a wealth of positive learning experiences that constitute a spring board to more of the same. Roscoe: Please let them know I am so, so, so happy. I truly am. They now have my replacement. Roman (baby) is my replacement and I am very proud of him taking my place. Please let Roe know I was ready to go, I waited for the correct moment to let go. It was just in time wasn’t it for me to slip away and let the baby take my place. He will have a very good home. He will. BN: How did you feel about Roe and still feel about her? BN: Did you know it would work with Roe at the shelter when you first met her? Roscoe: I never guessed. I never imagined. I never conceived how good my life came to be after I met Roe. BN: It was difficult for Roe to make the decision to let you go. How did you feel about that? Roscoe: I was ready. I showed her I was ready. I was sad but I knew my replacement was on its way—I knew. BN: Roe apologizes for not having as much time for you when you were young. Roscoe: Did great. Had no expectations. Was so, so, so lucky to be with Roe. BN: How is it on the Otherside? Roscoe: Fine, I’m adjusting. Healing. Getting stronger. When I’m stronger I will visit. I will say hello to Roe. I will. BN: How did you feel about Rahul? Roscoe: Best, best friend. Adore Rahul. Will visit Rahul too. Will. In the car will visit in the car! BN: Did you have a physical break down of some sort before you crossed over? Roscoe: No, it was my time. I was done. It was my time. BN: How did you feel about the baby shower? BN: Roe and Rahul thank you for making them a family. They are so grateful to you. Roscoe: My, my, I’m so grateful to them. Without them I would be nothing, nothing, nothing. BN: Is there anything else you’d like to communicate? Roscoe: No, I’m very tired—need to conclude our wonderful time together. So, so, so grateful, so, for this. So. Roe and Rahul gifted Roscoe with an opportunity to connect one last time and completed the circle of their life together. The elusive awareness of “infinity” becomes more tangible in the capsule of the communication. It is something that is felt in the heart and soul, not in the mental mind. Among other things a bit too complex to explain here, Roscoe is adapting to being without his physical body. He also had to lower his present energetic frequency as I increased the level of mine for us to mutually connect. Heart centered telepathic communication burns energy much like an alkaline battery. I have to be watchful not to get too drained and depleted. Rest, tea, dark chocolate and almonds and a good show on TV are excellent at building me back up. As for Roscoe, I have no worries. He is in good hands where he is and will be restored in no time. Because, on the Otherside, there is no time as we know it. Made me cry with happiness. Filled my heart with joy. Brigitte you once again shine light on the value and gift our amazing relationships with our loving pets provide. I fondly remember the many sessions we’ve had together and the insights you gave to me the owner as well as messages from my dear pet friends. And “Teddy Bear” says hi. He is sooo happy. Hug of gratitude for who you are. I’ve been waiting for this Part 2… loved it. Crying tho.. Roscoe’s story makes me think of our Rascal. With the not feeling like he could be ” with ” and feeling important and valued. I believe he does now. Roe & Rahul sound like very special people. Thanks for sharing this.